If you would like to contact Core Geophysics about engaging our services or for more information please give us a call, send an email or use the online form. 10 September 2018 – CORE provides GPR surveys over Rift Valley Resources Longonjo NdPr Project, Angola. 15 January 2018 – Lucapa discovers diamond bearing Lamporite at Brooking Diamond Project. 1 August 2017 - CORE provides GPR surveys over Blina Diamond Project. 1 June 2017 - CORE assists with conducting GPR surveys over Lakes. CORE has been working closely with one of it’s overseas clients with conducting innovative GPR surveys to image remnant material beneath historical pits which are now full of water. With some simple solutions applied (photo) the survey was successfully completed. 22 March 2017 - CORE provides geophysical support to Meridian Mining in Brazil for Tin, Gold and Manganese projects. CORE has been assisting Meridian Mining with ground based geophysical surveys and training including ground penetrating radar and induced polarisation, as well as modelling and interpretation of geophysical datasets. In addition, CORE would like to congratulate Meridian on the successful signing of the Investment Agreement with Coopersanta and Coopermetal. 25 January 2017 - CORE conducts ERI and CMD-DUO survey at waste station facility to locate fluid pathways. CORE completes trial ERI and CMD-DUO surveys at regional waste station facility to assist in mapping groundwater flow and to provide base level readings. CORE completed surveys using 64 channel Flash-RES system and it’s own CMD-DUO conductivity meter. 15 November 2016 – CORE completes high resolution Salt Lake GMAG Survey. 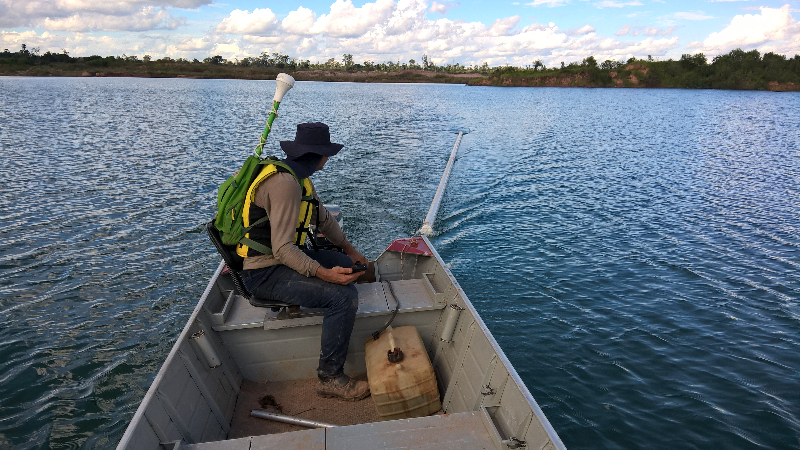 CORE successfully completes a high resolution GMAG survey totalling 900km over a Goldfields Salt Lake. To undertake this work CORE built a simple but effective GMAG Sled suitable for towing behind a vehicle or QUAD bike over Salt Lakes. The system was able to achieve production rates in excess of 140km day. Not being affected by strong winds it is a viable alternative to UAV surveys and also fixed wing surveys for small blocks. For more information please contact us. 23 September 2016 – Introduction to GPR Workshop. CORE in conjunction with Groundradar pleased to be sponsoring the ASEG WA Branch “Introduction to GPR Workshop” presented by Dr Jan Francke” on Friday 23rd September 2016 (click here). 13 June 2016 – Geophysical Interpretation assists KalNorth at Kurnalpi Project. CORE interpretation of detailed gravity and aeromagnetic data attributed to KalNorth’s success at Schiedam Prospect. For more details, please see the ASX release from KalNorth (click here) . CORE can integrate company and available government geological and geophysical datasets to produce high quality interpretations (click here) . 23 May 2016 – Detailed interpretation completed for Lithium Power International (LPI) at Pilgangoora-Houston Creek Lithium Project. CORE has recently completed a detailed aeromagnetic interpretation (click here) from a recently acquired high resolution survey over LPI’s Pilgangoora-Houston Creek Lithium Project. LPI indicated “Results of the geophysical survey show significantly more detail than the GSWA mapping and interpreted bedrock geology in areas obscured by surface cover”. For more information please contact us. 1 September 2015 – CORE adds CMD-DUO ground conductivity meter to survey and rental equipment pool. CORE has added a GF Instruments CMD-DUO ground conductivity meter to it’s survey and rental pool. The CMD-DUO is an advanced fully digital conductivity meter suitable for mineral, groundwater, and engineering projects to depths of up to 60m. The CMD-DUO provides rapid, low impact and cost effective surveys. The results can be modelled into conductivity/depth sections for better subsurface interpretation and detection. For more information please see our surveys page or contact us. 19 November 2014 – CORE completes successful UltraGPR surveys in PNG and Africa. CORE has been active in PNG and Africa over the past few months conducting high resolution UltraGPR surveys for imaging Nickel Laterite and Iron Ore. The surveys have defined ore locations and extents in some rugged terrain – see Gallery. The results are being used to best locate follow up resource drilling. For more information please contact us. 12 May 2014 – CORE linking with HGS Australia to provide geophysical consulting services. CORE is pleased to announce that it has entered into an agreement with HGS Australia Exploration Services (HGS) to supply geophysical consulting services. HGS is a one stop geological and exploration provider offering a complete range of geological exploration services including fixed cost drilling. For more information please contact us. 10 March 2014 – CORE sole Technology Partner with International Groundradar Consulting Inc. (Canada) to provide UltraGPR Surveys in Australia and New Zealand. CORE is pleased to announce that it has entered into an agreement with International GroundRadar Consulting Inc. (Groundradar) to be sole technology partner in Australia and New Zealand for the provision of UltraGPR surveys. UltraGPR is the most advanced deep radar system in the world offering the greatest depth penetration of any available radar system. For more information please contact us. 19 June 2013 – CORE assists Stratum Metals at their East Menzies Goldfields Project. CORE is pleased to announce that it has purchased a TerraPlus KT10 Plus S/C combined magnetic susceptibility and conductivity meter to compliment it’s growing rental equipment pool. The meter is capable of measuring to 10SI and convert to concentration of Magnetite%, plus measure conductivities up to 100,000S/m simultaneously, making it a powerful tool for Iron or Nickel Sulphide exploration. If you would like a demonstration for hire or purchase of the meter or for more information please contact us. A picture of the full kit are in the Gallery. CORE has added 3 VTEM Surveys and an Aeromagnetic survey to the Multi-Client Database. The Airborne EM includes VTEM at Yarrabubba and the aeromagnetics near Whim Creek. The outlines can be downloaded from the Multi-Client page. The CORE Multi-Client survey database continues to grow with the addition of 7 Airborne EM and 1 large aeromagnetic surveys. The Airborne EM includes VTEM around Whim Creek and Tempest near Kalgoorlie. The outlines can be downloaded from the Multi-Client page. The CORE Multi-Client survey database continues to grow with the addition of 6 aeromagnetic and 1 electromagnetic surveys submitted by Atlas Iron, Aura Energy and Oklo Energy. The outlines can be downloaded from the Multi-Client page. CORE is pleased to announce that it has purchased two new GPS enabled GEM ground magnetometers to compliment it’s growing rental equipment pool. CORE can also provide onsite training, plus daily data QC and processing to provide near real time feedback and data results within 24hrs. If you would like to hire the magnetometers or for more information please contact us. UPDATED: pictures of the GMAG’s on survey now in Gallery. The CORE Multi-Client survey database continues to grow with the addition of 2 high resolutions surveys from Mutiny Gold. The 100m line spaced surveys are located over the Gullewa Greenstone Belt in WA which is considered prospective for Gold, Copper and Iron Ore. The outlines can be downloaded from the Multi-Client page. 5 December 2011 – Legacy Iron Ore – Significant IP Anomaly at Robertson Range Manganese Project. If you would like to be notified when new information is posted, please join to our mailing list by entering “Subscribe” into the message on our contact page.